In the Caucasus region, Georgia, Armenia, Azerbaijan and their powerful neighbours Russia, Turkey, Iran and the EU negotiate their future policies and spheres of influence. 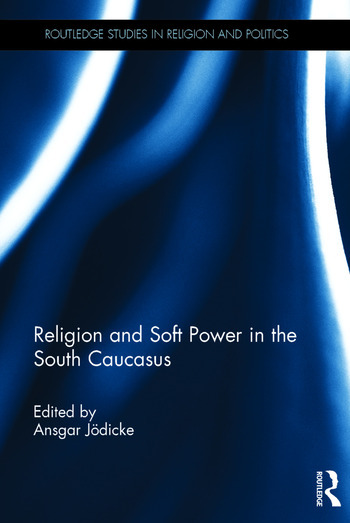 This volume explores the role of religion in the South Caucasus to describe and explain how transnational religious relationships intermingle with transnational political relationships. The concept of ‘soft power’ is the heuristic starting point of this important investigation to define the importance of religion in the region. Drawing on a three-year project supported by the Swiss National Science Foundation, the book brings together academics from the South Caucasus and across Europe to offer original empirical research and contributions from experienced researchers in political science, history and oriental studies. This book will be of interest to scholars in the fields of post-Soviet studies, international relations, religious studies and political science. Chapter 4: Iranian Soft Power in Azerbaijan: Does Religion Matter? Ansgar Jödicke is a senior lecturer in the Department of Social Sciences, University of Fribourg, Switzerland. His areas of research are religion and politics, in particular political religious education (politics) in Europe and the relationship between religion and politics in the South Caucasus. Together with Alexander Agadjanian and Evert van der Zweerde, he recently edited the volume Religion, Nation and Democracy in the South Caucasus (2015). Ansgar Jödicke has coordinated several research projects in the South Caucasus and in Switzerland. Among them, the SCOPES project ‘Religion and Soft Power. Religious Communities in the South Caucasus as Objects of External Influences’ (2014–2017) led to the results published in this volume.